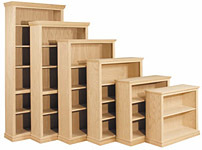 We have many stock sizes of bookcases to work from: Widths of 18" to 60" (by 6" increments), heights of 24" to 96" (by 6" increments), with depths of 10", 12", 16", 18", 20" and 24". We also offer custom sizing if you need it, at an affordable price. 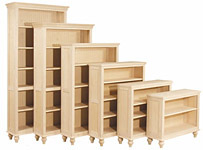 We can offer you a choice of over 30 different bookcase styles made of oak, maple or pine. 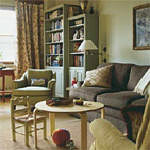 We even have a manufacturer offering paintable maple which is a great value for painting. 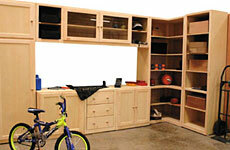 Set your creativity free and design a bookcase, wall system or storage cubby that matches your needs. 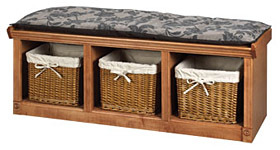 No longer do you have to be satisfied with what is in stock at a furniture store. Make what you want! Give us a call. 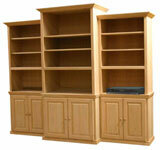 We carry stock oak, maple, or pine bookcases in several style in sizes. Stop in and take one home. 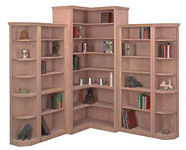 We offer in-stock bookcases as well as custom made. 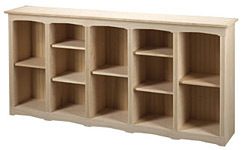 In-stock sizes ranging in widths from 24 to 48 " and heights from 30" to 96". 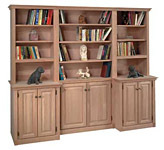 Ponderosa Pine Bookcases are all 10" deep; 18", 24", 30", 36" or 42" wide; 30", 36", 48", 60", 72", or 84" tall. 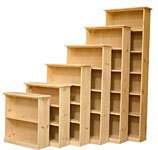 The following products are offered in all varieties of woods and styles and in heights from 24" to 96", every 6". 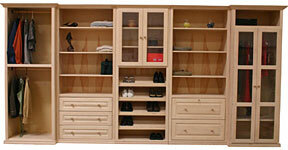 Doors are available for these units in all styles. 3. Choose the base height. Recommended sizes are: 30" or 36". Available heights from 24" to 96" every 6". 4. Choose your base width. Available widths are: 18", 24", 30", 36" or 42". 5. Choose your base depth. Available depths are: 16", 20" or 24". 7. Choose your hutch height. Available heights are from 24" to 96" every 6". 8. 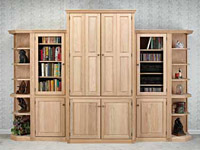 Choose the hutch opening: 15", 20" or 31 ". Hutch opening is the open area in the lower end of hutch, measured side to side. 9. Choose the width of the hutch. Available widths are: 18", 24", 30", 32", 36" and 42". 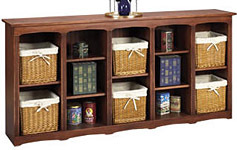 Please refer to "Specialty Bookcases" for 48" and 60" bookcases. 10. Choose your hutch depth. Available depths are: 10", 12", 16", 20" or 24". Recommended depths are: 12" or 16".